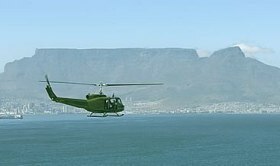 Cape Town Waterfront Helicopter Tours, Transfers and Flights. R34 900 max. 9 participants. From the V&A Waterfront, Cape Town. Vietnam US Marine Corps Bell 205 Huey UH-1, the doors are left open in simulated combat flying, the wind force is as high as your adrenaline rush, while viewing Table Bay, Table Mountain and the West Coast so low sometimes your feet get wet from the spray of the waves or get brushed from the grasses of the bush. Approx. 30 mins. This flight gives you an unrivalled aerial experience featuring the best of the Atlantic Seaboard - Table Mountain, V&A Waterfront, City centre, Greenpoint stadium, Sea Point, Robben Island, Famous four Beaches of Clifton, Camp’s Bay & the Majestic 12 Apostles. Same as above but including: Inspect the shipwrecks at Llandudno at low level and enjoy the rugged beauty of the nudist beach at Sandy Bay. Your exclusive trip will take you over the "Republic" of Hout Bay, the magnificent view of Seal Island and the stately Groot Constantia. Heading directly to the Southern point of the island. Circumnavigate this historical WorldHeritage site and return along the beautiful Blouberg coastline with a spectacular view of Table Mountain. This tour is the only helicopter tour around the island! V & A WATERFRONT CAPE TOWN. Winelands Tour and Game Safaris. Surveys, film shoots and promos. 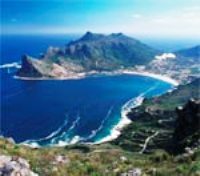 Enjoy the beautiful scenery offered by the Atlantico Tour and get greater value added by continuing over the breathtaking coastline of Chapman’s Peak and Long Beach. We cut through to the Indian Ocean and False Bay, Fishhoek, Muizenberg, Constantia Valley, Kirstenbosch, Newlands, City Centre and back. 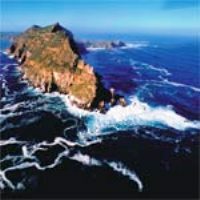 All the above except Robben Island but including from Chapman’s Peak to Noordhoek, the indigenous Flora & Fauna of the remote Scarborough and the Cape of Good Hope Nature Reserve, Cape Point, where the two Great Oceans meet is the ultimate aviation enthusiast's dream! On your return you will fly over the Naval Base and the White sandy stretch of Simon's Town. with Lunch option on Wine Estate. Asara, Boschendal, Blaauwklippen, Dannier, Lanzerac, Zeevenwacht. Including 2 hour ground time with Lunch. Grande Provence, Grande Roche, Haute Cabriere, Le Petite Ferme, Mont Rochelle, Seidelberg.